This coma patient currently feels like a saw is ripping through her spinal column, but because of her condition, she is unable to say anything. BALTIMORE—According to a study published Monday in The New England Journal Of Medicine, people in comas experience excruciating, indescribable levels of pain whenever they hear the sound of a loved one's voice. The Johns Hopkins University study, which used fMRI brain-imaging technology to monitor the cerebral activity of more than 400 coma patients while friends and family members talked soothingly at their hospital bedsides, found that every second a loved one was speaking, subjects felt pain so agonizing that researchers have likened it to the sensation of having one's skin slowly removed with dull scissors before being doused in gasoline and set on fire. "Whether the patient's sister was reading aloud from a favorite book or a spouse was relating shared happy memories, the data conclusively proved the participant was experiencing wave after wave of pain so torturous that you or I couldn't even begin to imagine it," said Dr. Adam Tyner, lead author of the study. 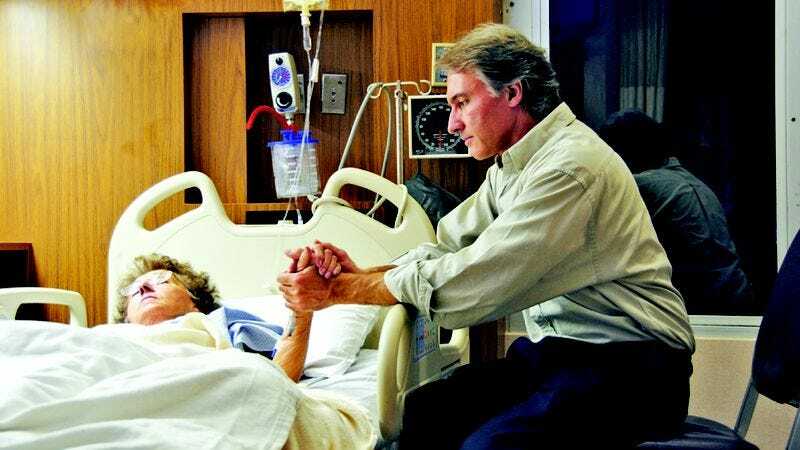 "After hearing a loved one speak, every single coma patient we observed exhibited a huge spike in activity within the pain centers of the brain, at levels comparable to those of someone dropped into a vat of hydrochloric acid and then forced to roll around in salt." "If you are in any way significant to or loved by a coma patient, it appears visiting that person in the hospital is the absolute worst thing you can do to him or her," Tyner continued. "You have to understand, if these individuals could speak, they would be screaming at their loved ones to please, for the love of all that is good and holy, stop talking." Tyner said the data also proved that patients were very much cognizant of their surroundings and seemed to know precisely who was causing them the worst pain any human being could possibly experience. He went on to stress that what the subjects were experiencing was not simply emotional pain, but a very real and horrible physical pain, similar to the sensation of being dragged naked behind a truck over miles of jagged lava plains covered with tacks and broken glass. "During trials in which a young son or daughter urged a parent to please, please just wake up, the pain reached an intensity so severe we can safely hypothesize these patients would gladly have jumped to their deaths from hospital windows cursing their children's names, had they the capacity to do so," Tyner said. In addition, the study found many other stimuli besides vocalizations that caused immense pain in coma patients. The smell of fresh flowers, the presence of Mylar balloons, or a loved one gently running fingers through the subject's hair all caused pain so extreme it would cause a healthy person to mercifully black out. However, because of their condition coma patients are unable to scream for help, and are instead forced to remain completely silent and aware as they endured a pain 10 times worse than that of a torture victim. "No stimulus compared to utterances of 'I love you,'" Tyner said. "Those three words resulted in a pain that has no known equivalent, but the closest approximation would be the sensation of hot, rusty needles flowing through one's very blood stream." Tyner said that the full implications of the study were still not totally clear, but that loved ones could take immediate steps to improve the palliative care of those in comas. "Don't talk to them, don't gaze upon them lovingly, don't even think about them," Tyner said. "Not surprisingly, the evidence suggests those in comas are so sensitive they can faintly pick up sympathetic thoughts from friends and family, which also causes them terrible, unimaginable pain." "The best advice I can give is that if you care for these people at all, just leave them completely alone until they either wake up or die," Tyner added.